H460 non-small cell lung cancer cells were exposed to the antitumor drug, etoposide. 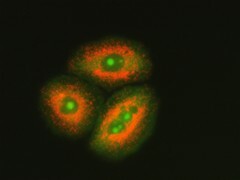 The image shows the H460 cells (in green) containing orange (acidic) autophagic vauoles that are extranuclear. The small bright green bodies are likely to be micronuclei. Autophagy represents a response to chemotherapy and radiation that may be one component of resistance to therapy. National Cancer Institute \ Massey Cancer Center at Virginia Commonwealth Univ.